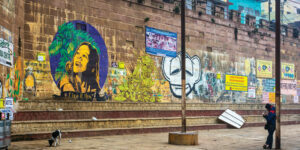 Varanasi, with its lanes exuding a mythical past, is a splash of colors on a large canvas. Nowhere in India one could find such a city where each street has some narrative to raconteur. 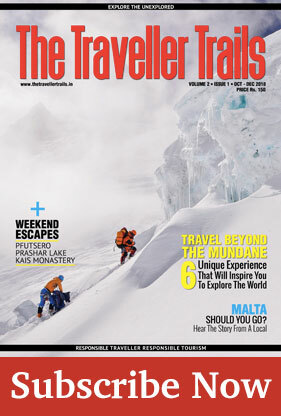 When Mumbai Mail chugged off Mughalsarai station in the early morning, we three, Dipankar, Niladri, and me ambled out of the coach, trudged the overbridge in partially awake steps and got wrapped up by a sheet of fog. 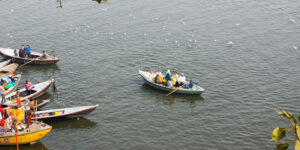 The very thought of a visit to Varanasi awakens our excitement. It fills us up with the expectation of exploring the hidden treasures of time. 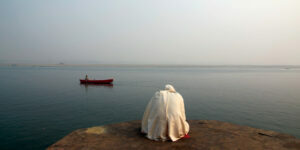 Unlike most other tourist destination, Varanasi with all its images magnetize us with its antiquatedness. Where else does one get charmed by the eloquence of past, by the tales enshrined in the aegis of time! As if being hypnotized by an unseen force, we entered the corridors in a hypnotic trance and took retrospective steps in the yellow brittle pages of history. We carved our way through the maze of streets where age oozes through the large casements, from the roots of trees patterned on the old walls, from the cold stones of the narrow lanes and from the closed eyelids of a lost ascetic. Varanasi or Banaras is a city of solitariness. The solitariness which is a refuge, a coveted withdrawal into one’s own self even though legions of humanity walk together, throng every possible corner and allow themselves to be a part of an endless stream of activities. Each cobblestone on the street, each brick of the multicolored walls where only shafts of light can peep through, seem to be churning yarns of voluminous scripted pages. Avoiding the deafening traffic snarls, the nagging horns of raucous tuktuk driver, hordes of pilgrims squatting on the main thoroughfare and shops of fuming kachoris and jalebis, huge cauldrons of milk and sweets, we veered into one of the countless by-lanes to listen to the sounds of the pulsating history. 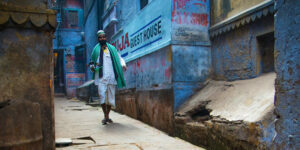 “Varanasi calls for primarily two things- aimlessness and nonchalance. And we three had plenty of those.” The garishly colorful saree-clad women and men with silk turbans walking inside the alleys are moving spectacle of colors. All ethnic shades of red, orange and yellow were abound. While Niladri was clicking the pulsating queue of pilgrims, Dipankar and I strayed off to another by-lane and met a venerable old sadhu in his saffron dhoti sitting in a street corner. Myriads of gods and goddesses were adorning the wall where he was sitting. Stooping over the pages of scriptures he was singing mantras and swinging his body with the rhythmic chanting. He remained seemingly oblivious of the continuous stream of people. 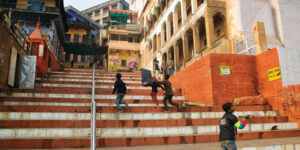 The age old stairs that leads to the Ghats. The overwhelming collectivity of the multitude notwithstanding, there is solitariness of each and every individual. Each one is apart from the other, yet there is a celebration of life’s collective voyage. 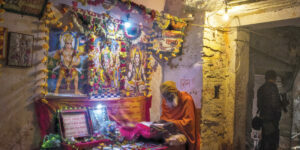 Dipankar sat down on a stone pedestal and struck a conversation with a local man beside whom a small turbaned dhoti-clad boy was juggling a snake coiled inside a basket. Pretty scared, I moved on through the dozing bulls, randomly parked bicycles and motorcycles and attracted by the sound of a growing percussion ensemble, moved inside a crowded and clamorous lane. The lane moved on to bifurcate into two alleys, neither of which was less travelled and were equally inviting with surprises and expectations of varied patterns of life. The crowd gradually thinned out. The beautifully painted large doors and the exquisite art works on the walls form a wild tapestry of hues. On every jagged turn of alleys, we saw mushrooming guest houses and yoga centers. It is a huge conglomeration of culture- cosmopolitanism of the widest kind. There is Chinese graffiti as well as Muslim fakirs. There are foreigners searching for spiritual enlightenment disenchanted with the mires of materialistic civilization. There are vagabonds like us who love to lose themselves inside this labyrinth. 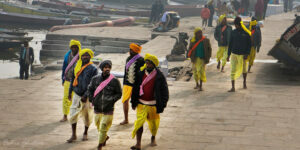 We regrouped and soon joined the endless procession of people moving towards the Holy Ganga Maiya. 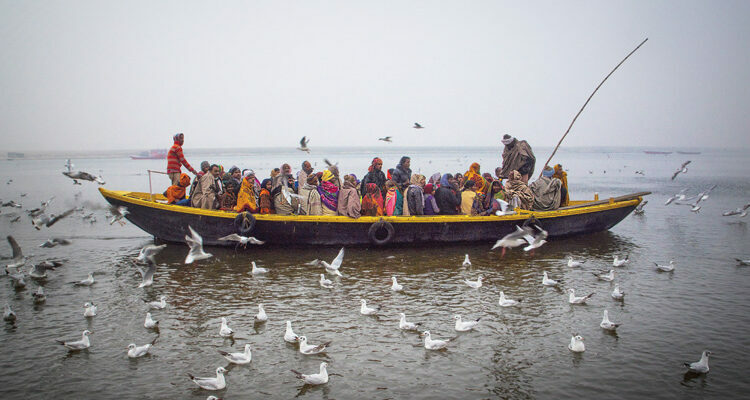 When we reached, the sky was turning caramel and the eager boatmen followed our trail with a cajoling voice to woo prospective customers for a boat ride. “Babu, don’t bargain. 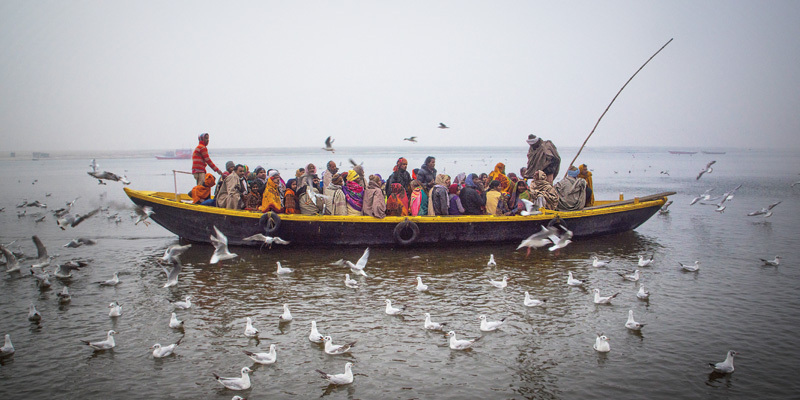 Take a ride and you won’t mind paying me more,” said Arun, the boatman. What’s the fun of being richer by 50 bucks by haggling with a poor boatman whom I don’t know. The setting sun in Banaras has an embalming effect. The expanse of the orange sky permeates the yellow sandstone structures that dot the Banaras skyline. The sound of lapping oars and the tinkle of temple bells coming from the lanes echo with the flutters of pigeons. A moulabi feeds the pigeons with bread crumbs standing on the lowest step of the Ghat. An aged Hindu family gathers on the knee deep water, floats lamp on it and pays their respect to the ever-flowing stream. We three friends settled down on the narrow deck of the boat and sat transfixed at the ripples of water as time slows down almost to a stasis. The tall structures beside the river stands like pillars of wisdom. Spirituality seeps in from everywhere. A harmony in heterogeneity, all the apparently discordant notes merge together into a divine tune that permeates the air. Maybe a perceptive ear could feel the music of Bismillah Khan’s shehnai heard over the ages. The air is thick with the morning azaan of a mosque and the evening aarti of Hindu purohits. A naked boy somersaults into the river where a sage immerses himself in his voyage of self – discovery. A wandering monk smears vermilion and ashes in a trance with only a stray dog and a sleepy ox witnessing his crazy antics. Celebration of life and enjoying the journey of life while forgetting the ultimate destination makes everything drench in ecstasy. The boat was floating parallel to the ashen-faced frenzied men on the road. They were dancing and singing hymns in a hypnotic trance. Some urchins were dancing to the percussive beats of cymbals and drums. The evening aarti was going on in great fervor. Thousands of devotees were pouring in to observe the divine flame flying heavenwards. 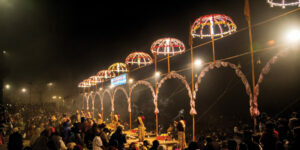 The show of revering Ganga Maiya with thousands of brass lamps, incense sticks, flowers and other props with continuous chanting of mantras and songs holds everyone in wonder. The grand show defies the difference of riches and credos. We were looking at the proceedings from a distance while the oars were lapping the water gently. From a boat near us, a boy with his younger accomplice was flying a kite. The gulls were swooping down on us to catch the food Niladri was scattering at them. Clearly amused at Arun’s self-styled philosophy, Niladri quipped mockingly while capturing pictures of the migratory birds. Perhaps this is the most worn-out philosophy that gets echoed in the city. There was the same matter-of-fact tone in the voice of Arun as it was when he quoted us the price of the boat-ride. By now, we reach the other end of our journey, the mythical Manikarnika Ghat Arun limply left his oars. The boat stopped moving in the still water. The vast spectacle of death was too stark to bear. A little boy was looking blankly at a burning corpse. The last rites were going on amidst giggling, casual chatting and card playing. I mused looking at the men poking the half-burnt body with a log. A lurid, pungent smell filled the air and flying ashes were turning the crimson sky cadaverous. Arun’s voice broke the silence that almost instinctively dawned on us. My eyes were transfixed on the stairs of surreal activities. Piles of logs burn the corpse of men, floating ashes of the mortal frames coordinate with the frantic cry of widows while a self-engrossed sadhu meditates at this valhalla of death. 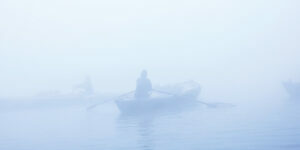 While Arun’s oars starts slapping the placid water again, images in mind keep overlapping. A series of unanswered questions baffled me once again. My soul sing like the smouldering fire of the burning pyre. Arun’s monologue bring a wry smile on mine face. Often the uneducated boatman sounds like the wisest man on earth. We were floating alongside the macaberesque and melancholic intensity of Arun’s words as they thinned over the sound of lapping oars. I harboured strange feelings and ended up with a conviction that you need not be overtly religious to experience divinity. The mystic abode permeates through the senses, making way for a realization about life, its essence, existence and nothingness. Wreaths of smoke from the funeral pyres coiling skywards, diffusing a burnt stench in the air gave me a queer sense of sublimity and stoicism. 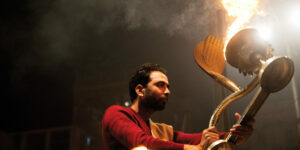 The culturally syncretic Varanasi invited our awe and veneration. It seemed as if we were culturally estranged from civilization. Our experience sobered us with an obvious and an inevitable sense of religiosity. There were moments when Dipankar, Niladri and me preferred to remain mute, freely sharing a moment of silene with each other. As we were gradually float away from Manikarnika ghat, Niladri again starts taking snaps of the thousands of flickering lamps in Ganga, looking like stars shining on water, floated by the devotees. Their messages and prayers would float up to the pantheon of God. Bargaining with the boatman seemed a bit lopsided and worldly after the philosophy he shared with us in the evening boat-ride in the Ganges. Gaping at the endless stream of humanity, I felt that while groping through the labyrinth of life’s jigsaw, there will always be an Arun to share with us the unfound answers so that we can moor our boat in the safe shore. HOW TO REACH: (By Air) Varanasi airport is well-linked most of the major cities of India like Delhi and Mumbai. 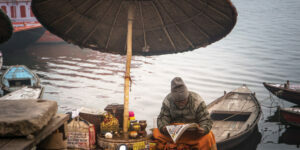 (By Road) Varanasi is connected to the major cities of Uttar Pradesh and neighboring states by state-run buses. Private air-conditioned buses are also available from nearby cities to Varanasi. (By Train) The Varanasi railway station is well connected to the major cities of India. From the railway station, tourists can hire a taxi or a cab to explore the city. It is a 12hrs journey from Delhi to Varanasi by train.